A dramatic finish at Dominica saw Pakistan win the Test off the penultimate over of Day 5 to send off their legendary batsmen, Younis Khan and Misbah-ul-Haq with a series win. West Indies had spent the whole day playing the resistance game led by the magnificent Roston Chase, who was left stranded on 101 as he saw Shannon Gabriel getting bowled by Yasir Shah to hand Pakistan the series. Pakistan had seemingly got through the Windies when they reduced them to 93/6. But Jason Holder and Roston Chase played brilliantly to halt the collapse. Hasan Ali got rid of Holder but Bishoo took on from where Holder left off. After Bishoo’s dismissal, Alzarri Joseph and Shannon Gabriel played out 54 balls between them as Chase on the other end recorded his hundred and looked set to lead his side to a fighting draw. But Yasir Shah tempted Gabriel into a wild slog with just six balls left in the day to complete a five-wicket haul and a win for his side. Here are the talking points from the Test. 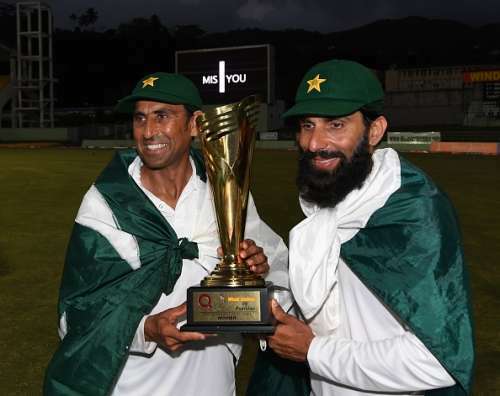 With Misbah and Younis Khan amongst their ranks, Pakistan have had the luxury of having two gritty Test batsmen in the line-up who wer also capable of playing the aggression game when needed for the last decade. And even the cricketing stars of the country seemed to have waned, the presence of this formidable duo meant that Pakistan were always a formidable force in the Test arena. Although Babar Azam and Asad Shafiq offer promise, their inconsistency will worry Pakistan. Having barely tried out anyone else in the middle-order might now leave them pretty vulnerable against a good bowling attack. But for a country who produce talent out of nowhere, another Younis or Misbah might just be waiting in the wings.